Arthritic knees are prone to swelling due to inflammation and fluid retention, which is what prevents them from bending or straightening. This can also cause the knee to lock or collapse when walking or rising out of a chair. Exercising an arthritic knee will not cure it; but it will strengthen the muscles which support the joint, and alleviate some of the other symptoms, such as pain. This is an article on rheumatoid arthritis, which examines how the exercising of an arthritic knee joint can be carried out at home, as well as at the physiotherapy clinic gym, and a hydrotherapy pool. The article begins with some aids to the simple but effective exercises that can be carried out at home. 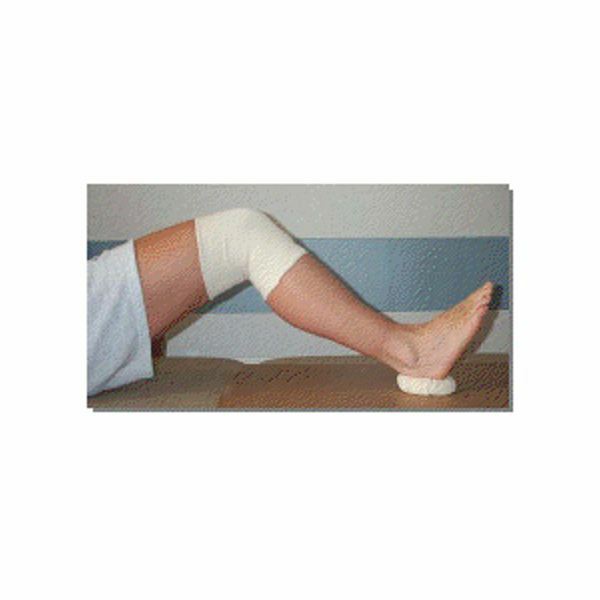 The under-knee support consists of a glass bottle, wrapped in an old bath towel, and held in place with tape. The sliding board can be made from a piece of wood with a shiny surface; such as an old kitchen cupboard door. A grommet can be made from a length of 2" wide cloth that is intertwined and fashioned in the shape of a polo mint. The links below are to websites from which these items can be purchased; however, local physiotherapists may supply these items on loan or at reduced prices. sportshop – elliptical machines and bikes. These are best carried out on top of the bed; some articles written by physiotherapists recommend doing them on the floor. This makes one wonder if these professional people have experience with rheumatoid arthritis; this author hasn’t been able to get up or down from the floor for 30 years! Before starting the exercises, a cold an ice pack should be applied to the arthritic knee for 15 or 20 minutes. A packet of frozen peas straight from the freezer, kept for this purpose, or a gel pack, which can be heated or frozen, can be used. Please remember to use a wet cloth between the icepack and the knee as ice can burn the skin, and a wet cloth conducts the cold from the pack to the knee; a dry cloth wouldn’t be as efficient. Start off the exercises without the use of any weights, and then as you progress, strap a 1-pound weight to the ankle. Continue the exercises, eventually moving on to a 2-pound weight. 1. Lying horizontally on the bed, put the bottle support under the bad knee, and pulling back the ankle, press the knee down onto the support. This will lift the heel off the bed, and tighten the quad muscles. Hold this position for the count of five, relax for a count of five, and repeat ten times. 2. This time, straighten the knee as much as possible while allowing the leg to rest along the surface of the bed. Now tense the knee muscles and lift the leg about 3" above the bed while keeping it straight. Hold for count of five and relax, letting the leg drop back down slowly using the quad muscles, and repeat ten times. 3. Place the sliding board under the leg with the grommet on the board at the extreme end away from you. Put the heel into the grommet, and bend and straighten the bad knee, making the heel slide up and down on the board. Repeat this ten times and if it is difficult, try sprinkling a little talc powder over the board to make the grommet slide easier. 4. While sitting on a high chair, bend and straighten the knee through 90 degrees, repeating the exercise until it becomes uncomfortable. These four basic exercises can be done in sets three or four times a day. 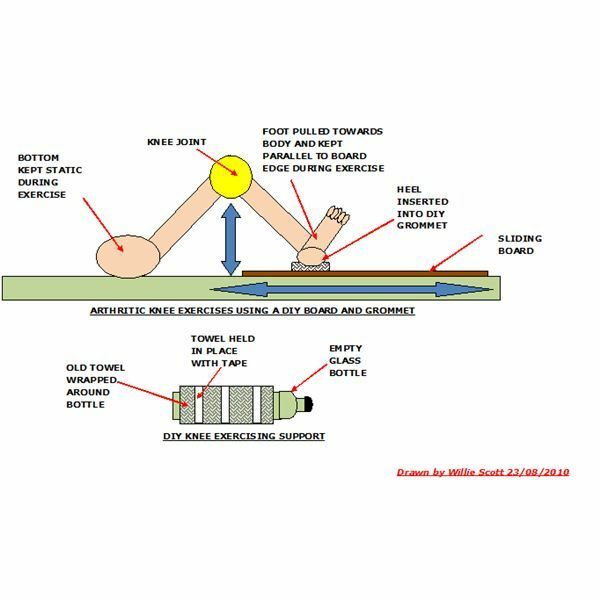 These are the same as the home exercises, except that they are supplemented by using the appliances in the gym, such as treadmills, rowing, and cycling machines, under the supervision of the physiotherapists. There are also parallel bars for balancing and taking all the weight on the bad knee, stairs for climbing up and down; remember coming down – bad leg (first) to hell; going up-good leg (first) to heaven. Finally, hydrotherapy is a great treatment for arthritis, especially for the arthritic knee joints, due to the combination of hot water (25ᴼC) and its weight bearing properties. Remember not to overdo the underwater exercises, as moving the knee joint is quite easy when in the pool. When sitting or resting, the bad knee can be elevated and supported on a stool; but never-ever put a cushion under an arthritic knee as a support while resting. This will feel more comfortable, but encourages gathering of fluid in the knee joint and the knee to remain in the bent position. This will be a series on living and working with arthritis, linked to other BH arthritis articles, where we will examine the causes and effects of arthritis on our everyday lives, what exercises help, what aids are available and finally joint replacement.